Volkswagen introduced the XL1, the world's most fuel-efficient production car, to the streets in 2013. This plug-in diesel hybrid for two people is being produced in a limited volume and has a European combined fuel consumption figure of 261 mpg as well as a carbonfiber body and chassis. Now, Europe's largest carmaker is applying the experience it gained from this technological showpiece and is applying it to a high-volume production vehicle. 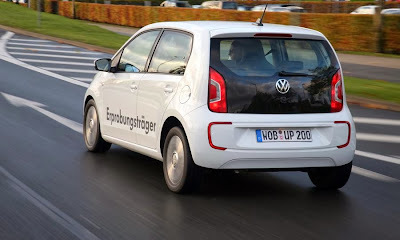 Volkswagen is presenting this new car at the Tokyo Motor Show: a plug-in hybrid version of the up!, called the twin up! concept car. This four-seater shares certain parts of its drive system with the XL1-including its diesel engine, electric motor, and DSG dual-clutch automatic transmission. Since all new Volkswagen vehicles are configured to accept alternative drive systems as well as conventional ones, it was easy to install the compact plug-in hybrid system in the twin up!. The only modification made in the production version was to lengthen the extremely short front overhang by 1.2 inches. The twin up! 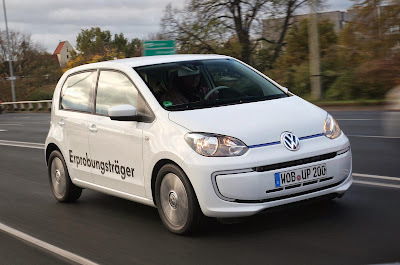 's 55 kW (75 PS) drive unit-consisting of a 35 kW (48 PS) 0.8-liter TDI Clean Diesel engine, a 35kW electric motor, a seven-speed DQ200 DSG transmission, and the power electronics-is mounted at the front of the car. Installed at the back, behind the rear seats and under the trunk, is the "fuel storage system": an 8.6 kWh lithium-ion battery, the 12-volt battery for the electrical system, and an 8.7-gallon fuel tank. The car attains impressive efficiency thanks to a combination of good aerodynamics (0.30 Cd), a low unladen weight of 2657 pounds, lightweight plug-in drive components, and low rolling resistance 165/65 R15 tires. In all-electric model, for example, the twin up! has a driving range of 31 miles. In the "New European Driving Cycle"-the standard testing and comparison driving cycle for plug-in hybrid vehicles in Europe-the concept car returns a sensationally low fuel consumption figure of 214 mpg, which equates to CO2 emissions of just 27 g/km. The twin up! highlights the fact that efficiency and driving fun will not be mutually exclusive in the future. In the city, in electric mode, the twin up! accelerates from 0 to 37 mph in 8.8 seconds on its way to a top speed of 78 mph. In hybrid mode, the car delivers 159 pound-feet of torque, a high number for such a small car. Out of town, the twin up! goes from 0 to 62 mpg in 15.7 seconds and reaches a top speed of 87 mph. Two-cylinder TDI. The TDI produces its peak power of 35 kW from just 830 cc. The two- cylinder TDI was derived from a common rail four-cylinder, 1.6-liter diesel engine and has a bore spacing of 88 mm, with a bore and stroke of 81.0 by 80.5 mm. The XL1's engine also shares key internal modifications for reducing emissions, which include specially formed piston recesses for multiple injection and individual orientation of the injection jets. The common-rail diesel's smooth running properties were transferred to the two-cylinder engine, aided by a balancer shaft that is driven by and turns at the same speed as the crankshaft. An exhaust gas recirculation system, an oxidation catalytic converter, and a diesel particulate filter are used to reduce tailpipe emissions. Hybrid module. The hybrid module is located between the TDI engine and the seven-speed DSG transmission: it consists of an electric motor and a clutch, integrated in the DSG housing in place of the usual flywheel. The electric motor is supplied with energy from the 8.6 kWh lithium-ion battery. The power electronics, which operate at 308 Volts, manage the flow of high-voltage energy between the battery and the electric motor and convert direct current to alternating current. Order under the hood. The engine compartment of the twin up! is completely covered. All service access points are in maintenance-friendly locations. A matte black engine compartment cover with acoustic insulation organizes all the recognisable components. The power electronics, and the service access located across from it, are integrated in a high-gloss black band, which also functionally partitions the engine compartment. An aluminium- look central capsule unites design themes from the world of combustion engines and electric motors, where the electric elements are coded in the colour blue. Interplay of drive modes. As previously noted, the electric motor can power the twin up! for distances of up to 31 miles and to a top speed of 78 mph. In electric mode, the TDI engine is decoupled from the drivetrain and is shut off. Meanwhile, the clutch on the gearbox side remains closed, and the seven-speed DSG is fully engaged. Provided that the battery is sufficiently charged, the driver can choose when and where the twin up! should be driven electrically by pressing the e-mode button. Restarting the TDI engine is a very smooth process. While driving, the electric motor's rotor is sped up and is very quickly coupled to the clutch in a process known as "pulse starting". This accelerates the diesel engine to the required speed and starts it, so the driver hardly notices the transition. Energy and drive management. When the twin up! is braked, the electric motor operates as a generator; its braking energy is used to charge the battery under regeneration. In certain operating conditions, the load of the TDI engine can be shifted so that it operates at its most favorable efficiency level. The gears in the DSG transmission are also always selected with the aim of minimizing energy usage. The engine controller regulates the entire energy and drive management system based on the specific load demanded by the driver. Parameters flowing into this control system include the accelerator or e-pedal position, engine load, energy supply, and mix of kinetic and electric energy, so that the system always uses the optimal type of propulsive power.